“Icicled Juniper” Tree Pin. $325. An icicled juniper shines with tinsel made of snow and light. Wings honors the shades of winter green and the power of the light with this tiny tree, cut freehand of sterling silver with upturned boughs and and flared trunk. The small but steady rays of the winter sun garland its branches as the scattered blossoms of remnant berries, hand-stamped, peek through; a winter butterfly, a bit of holiday magic, floats past beneath the twinkling star at its top. The icy tinsel shimmers in a single moonstone, while the jade and turquoise of the evergreen shows through above, all by way of small round bezel-set cabochons. 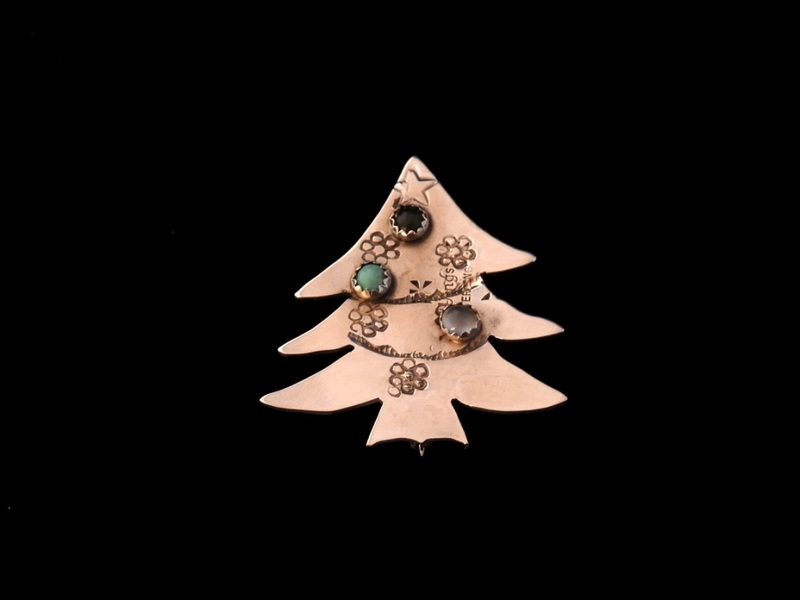 Tree stands 1-1/2″ high by 1-3/8″ across at the widest point; cabochons are 1/8″ across (dimensions approximate). Posted on Sunday, December 16th, 2018 at 6:49 pm. Filed under: Pins	RSS 2.0 feed.